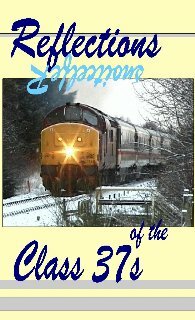 This is the fourth and possibly most remarkable in the series of Class 37 programmes. We cover a total of thirteen years between 1987 to 2000 and feature many classic liveries including BR (British Rail) Blue, Large Logo Blue, Red Stripe Railfreight as well as more up to date paint schemes. Following on from where Eclipse of the Class 37s left off, in ‘Reflections of the Class 37s’ we see some unique and astonishing action from Southern France where the Class 37s are assisting with construction duties connected with the new high-speed Travelling Goods Vehicle Link. This time sees them in action on the Southern steeply graded section where multiple type 3s tackle the infamous 1 in 30 gradient at Donzere. Definitely a head banging session and definitely not for the faint-hearted! In the UK we see some spectacular views from Cornwall to Caithness literally, and view some of the most wonderful and memorable scenery in between. Train details appear as captions and narrative has been deliberately omitted so that the truly distinctive sound of these locomotives is not compromised. Produced by GLOBE VIDEO FILMS and released August 2000.